I realized the blog became too girly lately so I thought I'd switch it up a little. Also, I was surprised to learn that the last time I've done this smokey eyes look goes back to February 2012. I mean, remember the days when it used to be a somewhat signature make-up here on Intrigue Me Now? Do you think I should turn to the old habit more often? Oh, and the photo with a stranger turned out to be quite a success on my Instagram the other day, I'm assuming we share the same taste in men. Just saying. 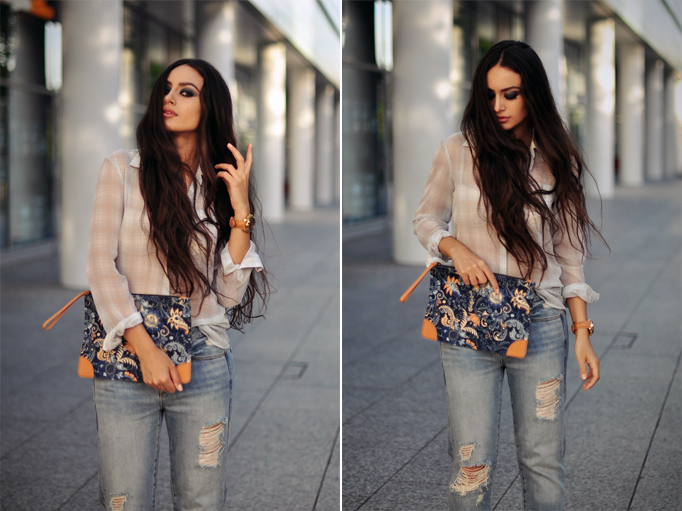 Fabulous jeans and clutch! You look wonderful! you look gorgeous! The pictures are so nice, and the outfit suits you soo good <3 i love it! u look perfect! - like always! the eye make-up, sheer top and rugged jeans is something! Love the Gap jeans, such a perfect fit! Pretty cool outfit! You look fadulous! noooo...smokey eyes don't fit you so good. i prefer you more natural. great outfit. love the shirt. I wouldn't know what to choose, the clutch, the jeans, the heels, the shirt, your smokey eye to perfection (I should really give it a go). Good taste in men, confirmed. Gorgeous outfit, love it ! looooove this outfit, you are an absolute stunner! I particularly love that photo of your watch and heels - the perfect match! you look great as always, my dear :* great post! I like your shirt and heels! For me, you´re the most beautiful woman in the world!!! Love the boyfriend jeans on you. What are you beautiful. Very gorgeous image! fab look! 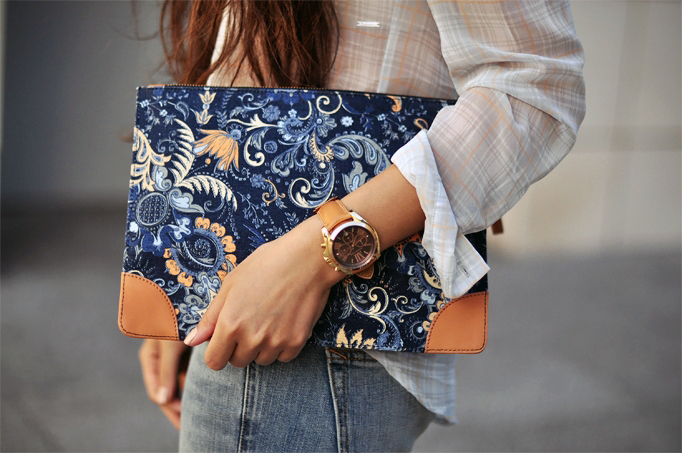 love the clutch!!! smoky eyes, shirt, boyfriend jeans-i couldn't ask more ;-) perfect! With smoked eyes or not you are a pretty girl beteen other pretty girls!!! Are you fishing only for compliments in your life??? No problem you look a nice girl between the others.,. Check my blog out hun. make up, shoes, bag... perfect! I agree with above sentiments, the smokey eye looks so great! looks beautiful with long hairs and smokey eyes. I don't think that you should turn to the old habit more often, girly look fit you more perfect. Wish that whole boyfriend fit suited me. I love the heels,I love the color of it..
you are stunning and that bag is pattern perfection! smokey eyes fit you perfectly.Fabulous jeans and clutch! You look wonderful!